A couple days ago there was a Dilbert comic [edit: added local copy] where the pointy haired boss lets Dilbert have two flat panel monitors so he can feel "like an evil genius in a secret lair." 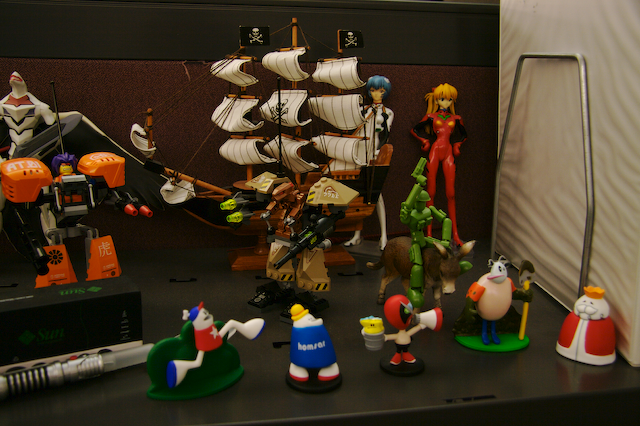 Of course I had to print that one out and put it on my cube wall because my cube makes an awesome secret lair. As you can see, I've got the requisite two flat panel monitors, plus a laptop. 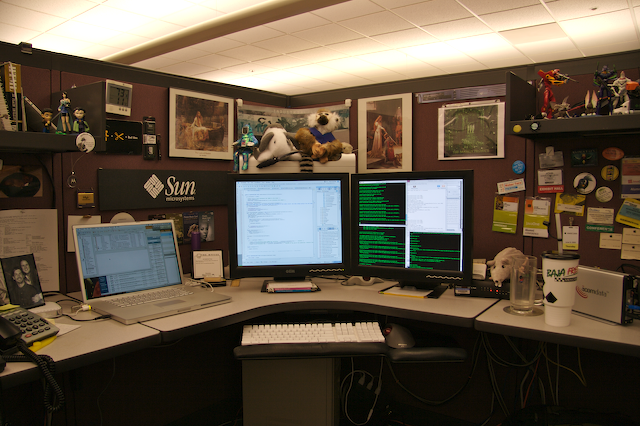 And behind those flat panels (under Bun Bun and the lemur) is my workstation, Tralfamadore, a quad-core 3GHz Mac Pro. And off to the left is my laptop Magrathea, a 17" G4 PowerBook. It's 2.5 years old now, so not quite as fast. It works well for most things, but just can't handle IntelliJ or Aperture very well. 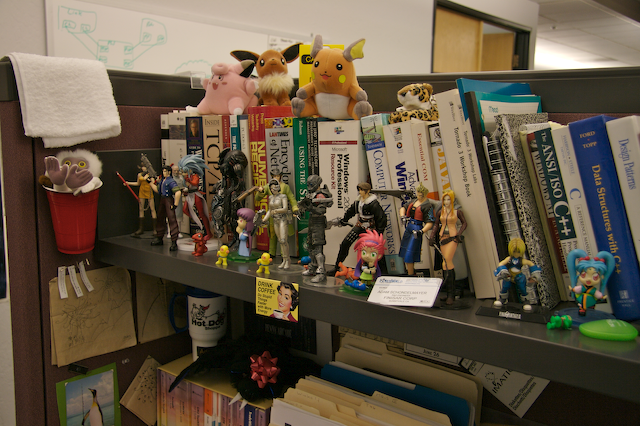 Of course, I have the requisite toys, and tech books. If the books look hard to get to, it's because they are. I mostly use Safari Bookshelf and Google for all my reference needs. And the pièce de résistance: my couch. 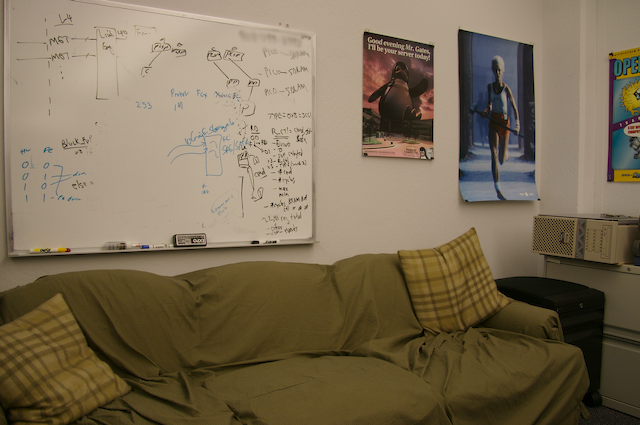 Yes, I have a couch... in my cube. Oddly enough, most people who visit me end up sitting on the cabinet (the one under the old Sun box in the background). They must be afraid that if they give in and actually sit on the couch, they'll never be able to get back up. But Tim's not afraid. He always sits on it when he visits me. Oh, and that's his cell phone number I had to blur out on the whiteboard. Well, that's my secret lair. Where I spend way too much time. It's hard to get some good pictures when the sun's already set by the time I get home. This page contains all entries posted to A Thousand Words in October 2007. They are listed from oldest to newest.